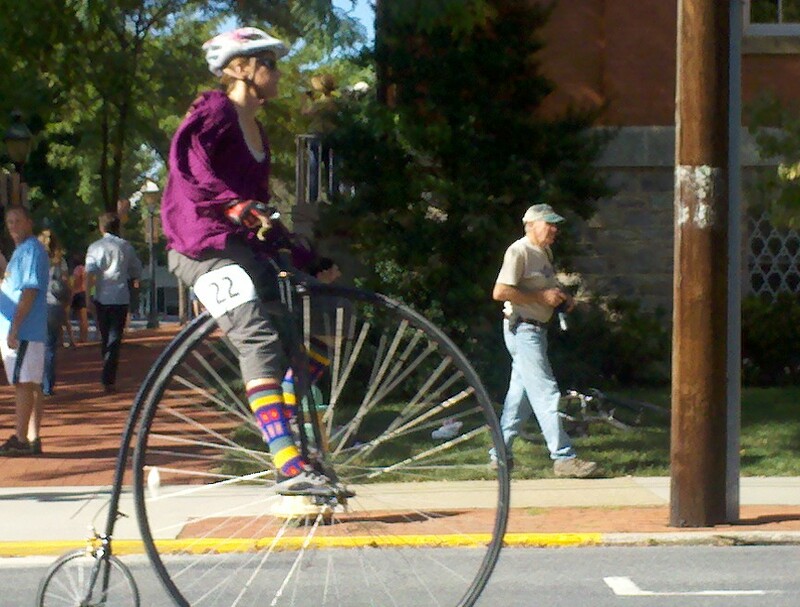 Tempo and Speed: Sunday Schooled - A Bicycle Built for Who? Sunday Schooled - A Bicycle Built for Who? I usually reserve my Sunday Schooled posts for things that I have learned from my kids or have otherwise learned from the humbling school of parenting experience. Today's post is not about something I learned from my kids but about something I learned from the world. And you could learn a little something here too. Today we learn about penny-farthings. 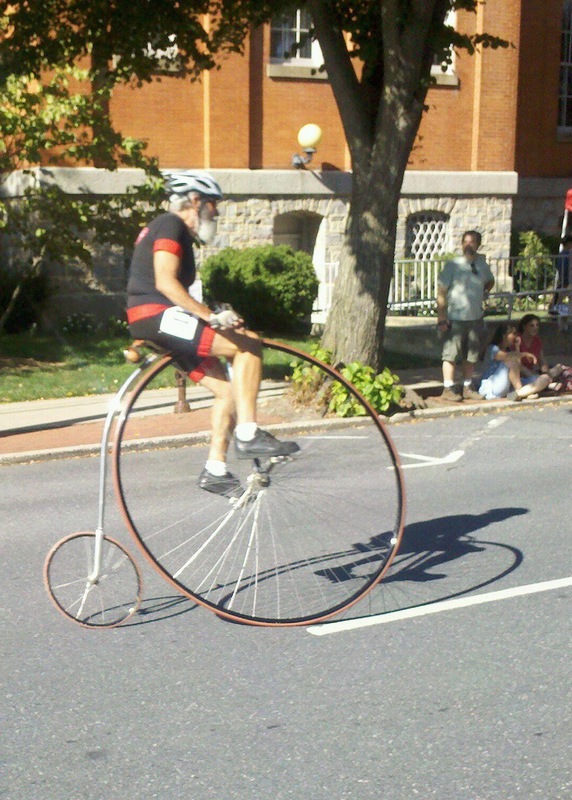 Penny-farthings or high wheel bicycles are what you might think of as the old-fashioned, original bicycles popular in the late 1800s. Their name comes respectively from the British coins of differing sizes, big penny in the front, little farthing in the back. In America, we might have called them "quarter-dimes" but that doesn't have a nice ring to it at all, even if you do say it with a British accent. 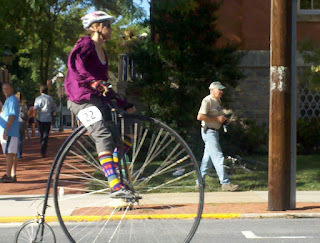 only high wheel bicycle race in America. 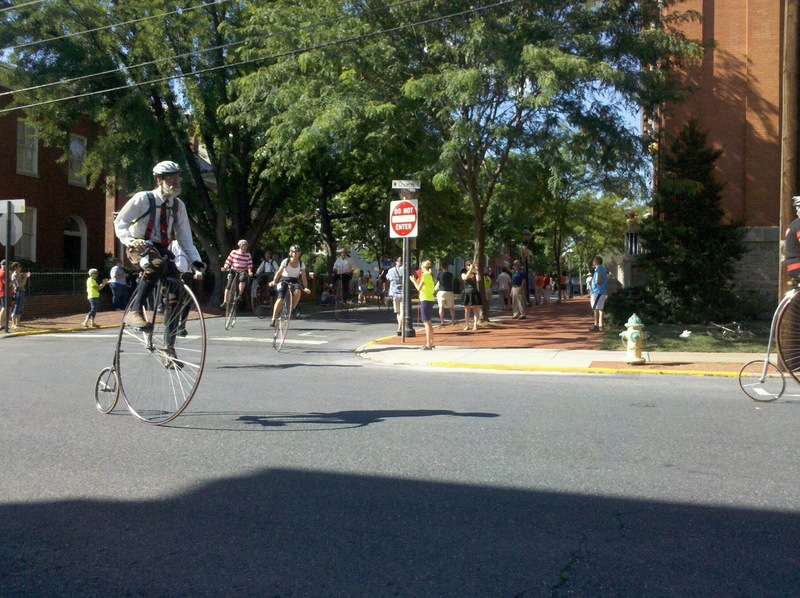 As one of the events in the weekend long Tour de Frederick, The Frederick Clustered Spires High Wheel Race involved a half-mile circuit course through our historic downtown. Riders looped their antiquated looking contraptions around the city blocks to the thrill of the gathering crowd. It is what I would call a spectacle. And it was spectacular. 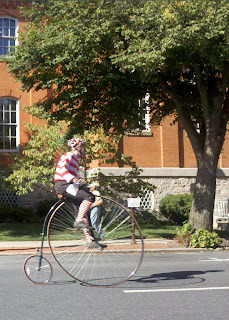 Apparently, penny-farthings riders are not only unique in their mode of transporation, but also in their fashion sense. Riders wore knickers, lederhosen, argyle socks, jockey silks, and business attire. One female rider finished off her look with black pumps. And yes, there was one rider with a handlebar mustache. Penny-farthings were a bit dangerous. Way back in the Victorian Era, high wheel riders were falling headfirst over the big penny wheel, many times to their death. Thus the phrase "taking a header" was coined. Cobblestones are unforgiving to those who don't wear helmets. Seeing high wheelers perched atop their machines can only make you smile. Most public events today are centered around serious competition. I am sure that these high wheelers have grand standards for themselves in their endeavors, but I suspect they all have a very healthy sense of humor to go along with their sense of adventure.﻿ I think the word whimsy has to be found somewhere nearby when you talk about high wheelers. great pictures - I did not know they had a race of these antique machines. Do they even have brakes? It's a long way to the ground. I love those old bikes! I was watching American Pickers a while back and saw the reverse of a penny farthing - still pre-1900 - much safer and still very cool! Well, now I have been schooled. I never knew the name for these and I didn't know they were still around. I especially like the first photo -- the guy is dressed like Lance Armstrong but riding this very old school bike. Cool! Who would have thought such a very English thing is still being enjoyed in the USA. Fantastic post. I don't even understand how you get on one.